Parent-Teacher communication is encouraged. If you have a specific question about your student's progress in a class, please contact your student's teacher via phone call or email and ask the teacher to return your call or email. It is imperative that parents understand the grading (#2624) and attendance (#5200, #5240) policies and regulations as approved by the Board of Education. The complete policies are accessible in the student handbook and on the district website. Parents should familiarize themselves with these policies and regulations. For further clarifications, please contact your student's school. The WEEKLY SUMMARY displays a snapshot of all assignments that are due for the selected week. 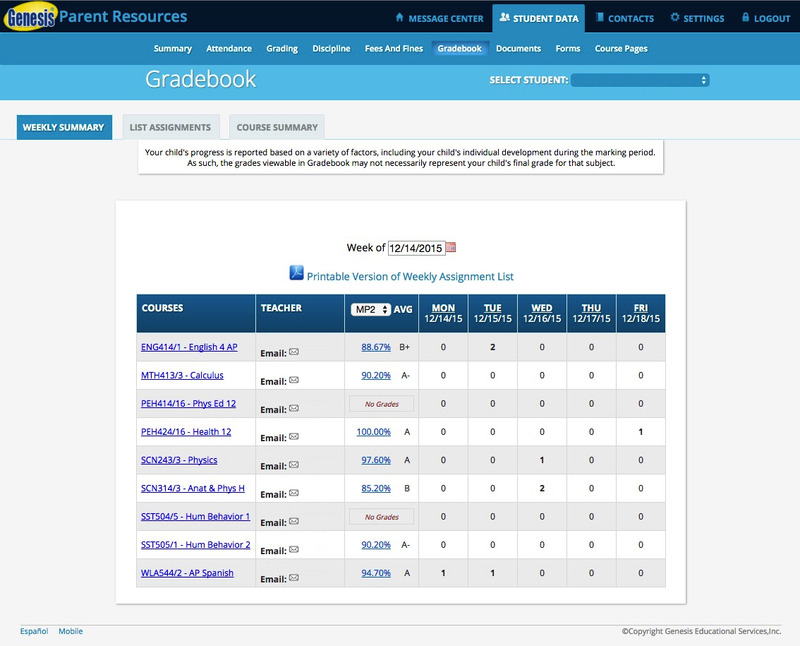 Click on a COURSE NAME to display the LIST ASSIGNMENTS tab with all the course assignments for the Marking Period "MP". Click on a COURSE AVG to display the COURSE SUMMARY tab with all the course assignments that have been graded in the MP, the current grade, grading information, and class attendance. The average for the current MP is displayed, click on the dropdown in the AVG column to change the MP. NOTE: If you tab away from this screen and then return, the averages for the current MP will once again be displayed. The LIST ASSIGNMENTS screen allows you to search for assignments using the dropdown arrows for Course, Assignment Due Date, Status, Assignment Date. Below is a screenshot of the options available for Status. Besides grading an assignment, a teacher can also attach a comment related to your student's work or a message to the class. To view a comment, click on the pushpin (in the column between GRADE and MAX). NOTE: If a teacher has entered a comment on an assignment, please take time to view it. Teachers have four special grades that can be given for an assignment (Absent, Missing, Incomplete, or Exempt). Initially, these special grades appear in the GRADE column (ABS, MI, INC, EX). 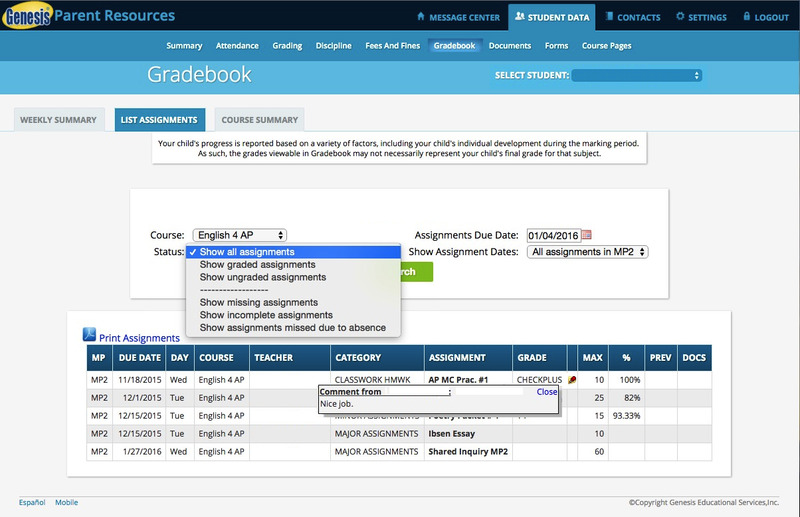 When a teacher gives one of these special grades and then later changes the special grade, the original "special grade" name is displayed in the PREV column on the List Assignments screen. The teacher cannot clear the "previous grade" - it is always displayed to you. The Previous Grade may help you to understand why your student received a lower grade. Excellent work turned in late often receives a reduced grade. ABSENT "ABS": Your student was absent on the date the assignment was due. This means your child has a chance to make up the work: The ABSENT grade is not counted in your student's average until the teacher changes the grade. When a grade of ABSENT is changed to another grade, "Absent" appears in the PREV column. MISSING "MI": Your student did not turn in an assignment or take a quiz or test. The MISSING grade is counted as a zero "0" when calculating your student's grade for the course. When a grade of MISSING is changed to another grade, "Missing" appears in the PREV column. An assignment that was previously MISSING was turned in late. INCOMPLETE "INC" Your student partially completed an assignment but did not finish it. When a grade of INCOMPLETE is changed to another grade, "Incomplete" appears in the PREV column. An assignment that was previously INCOMPLETE was turned in late. EXEMPT "EX": Your student is not responsible for completing this assignment. The assignment is not included when calculating your student's grade for the course. NOTE: When a student is explicitly EXEMPT from an assignment they are not usually later given a grade, therefore, it is unusual for EXEMPT to appear in the PREV column. The COURSE SUMMARY lists all assignments and grades for one course in the current marking period. Use the Course Summary drop down arrows to change the course. COURSE SUMMARY only displays the current MP. To see a previous marking period, go to the LIST ASSIGNMENTS tab and use the "Show Assignment Dates" dropdown to select another marking period. If the teacher has attached a comment to the assignment, click on the pushpin (in the column between GRADE and MAX) to display the teacher's comment about your child's work or a message to the class. If a teacher has entered a comment on an assignment, please take time to view it. The PREV column is used when a student's grade is changed. 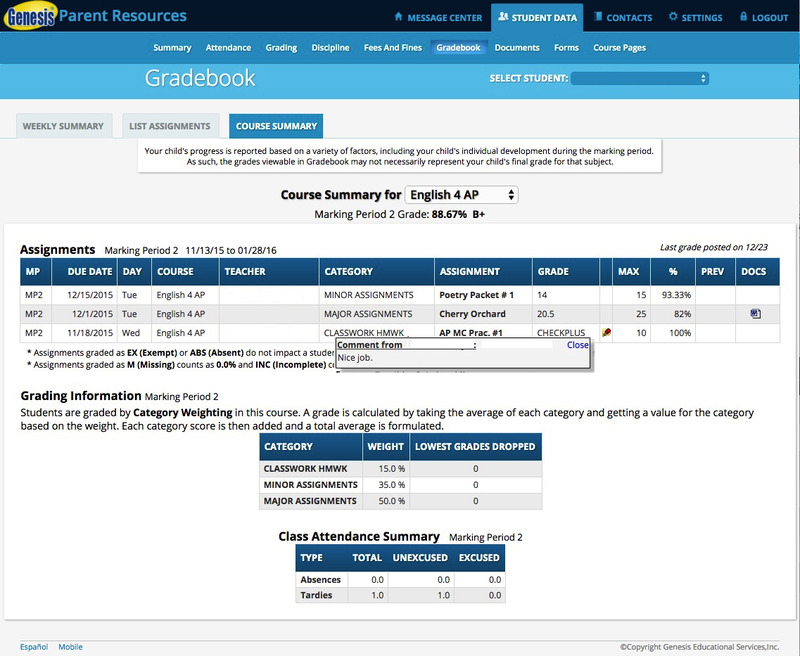 For example, if a student turned in an assignment LATE and the assignment had been graded as MISSING, once the assignment is "re-graded" the PREV column would show MISSING. If the teacher has attached a document to the assignment, click on the document icon in the DOCS column to display the file.